Bryanna ‘Bry” Marie is an Arizona-based artist who specializes in painting on coins, preferably pennies. She’s only been doing it for four years, but looking at the tiny details she’s able to reproduce on such tiny canvases, you’d think she’s been doing it her whole life. Painting is the only thing Bry Marie has loved doing ever since she was a child, but she only started painting on coins four years ago, as a challenge she set for herself. She had always loved using oil paints on copper, but she wanted to see if she had the steady hand required to paint tiny details on a very small surface, so she chose the penny. After finishing her first miniature painting, she felt a sense of accomplishment she had never had with her previous works, so she decided to paint with oils on coins exclusively. Marie says that painting with Abraham Lincoln’s face in the background was a challenge in the beginning of her career as a penny painter, but she’s gotten so used to it that she now sees the US President’s head as part of the artworks she creates. Speaking about her ability to create such detailed paintings on a tiny surface like the penny, the Tucson-born artist said that it’s all about “steady hands and bright lighting”. Even though she only started painting on coins in 2015, Bry Marie has already made waves both in the art world and on social media, where her stunning artworks routinely go viral. 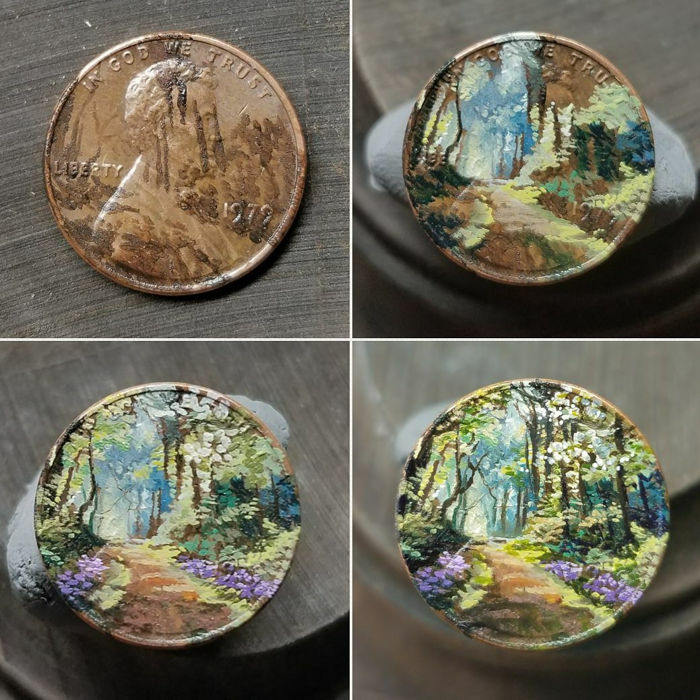 Last year, a photo of one of her coin paintings got over 39,000 upvotes on Reddit, and her follower count on Instagram has more than tripled in less than a year. To learn more about Bryanna Marie’s art and check out more of her beautiful paintings, check out her official website.